Did you Know – Size restriction in SQLExpress applies to only data file(s)? I was contacted by colleague of mine and he informed that he has seen 19 GB database size on SQL Express 2008 R2. He read that limit was 10 GB and asked is there any workaround to elevate the limit? So, as a follow-up to Guru’s post I did further research and found interesting information. Size limitation mentioned in his post are actually limit for data file(s) only. Which means I can have a database for total size more than specified in his post’s table. Actually this makes sense to me because log file is for recovery purpose not to store user data. Also, this limit does not include filestream data (this is tricky to track) because user can store many images, more than 10 GB and still stay within the limit. Help : Select query filling up my disk space!!! Sounds strange? Yeah and that’s the reason I am blogging about this. And recently I saw this question in forum as well. Have you ever come across this scenario? Here is the repro of the issue and explanation. Below is the screenshot of my windows explorer space usage before I fired the query. Empty space in C drive dropped from 21.9 GB to 20.9 GB (Yeah you read is correct, it’s 1 GB) I have run process monitor and filtered results for ssms.exe. 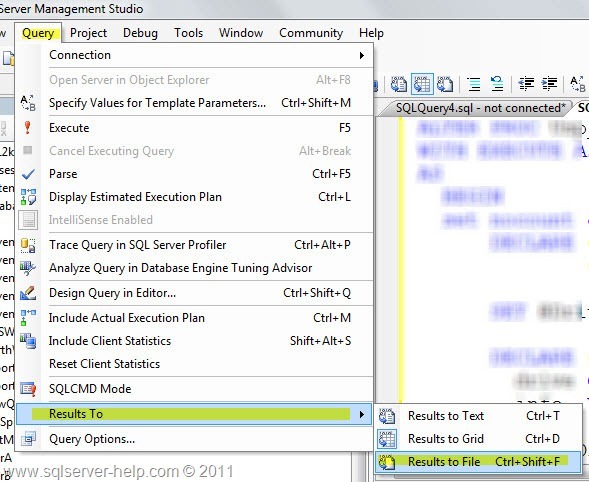 If you look closely and compare above tmp file with management studio result window, it would be evident that ssms is writing the result in tmp file. Don’t run query which has HUGE result set on server directly. If you have such need, redirect the output to “file” rather than shown in management studio result window. This can be done by two ways. 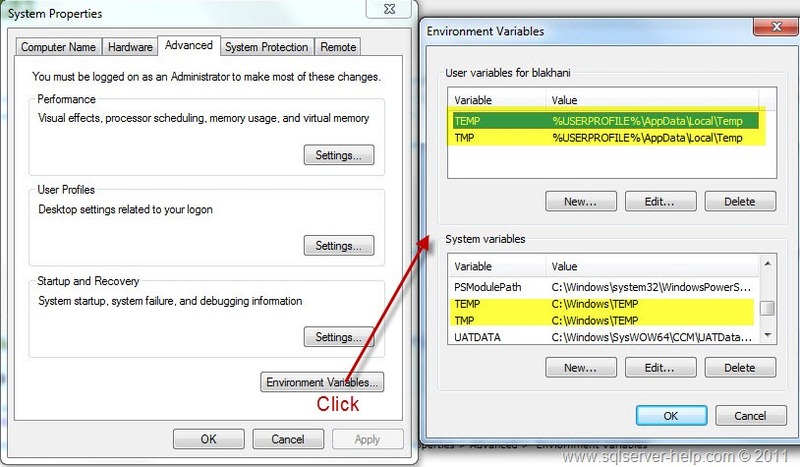 Another workaround would be to change the TEMP/TMP path in environment variables as shown below. I love my customers and hate to say “No” and send them back empty handed. So, I put a little efforts to help them and found way to do it using proxy account. Here are the steps. Enable xp_cmdshell if its not enabled already. Create below stored procedure which would provide the details about disk space. This has taken from internet and I am not author of this. I have done little modification to original code to get same output as xp_fixeddrives. Since we are not going to give permission to SQL login on xp_cmdshell so we need to use proxy account. Windows account would be a Admin account. To test this we need to create a new SQL login, user and grant execute permission on the stored proc created. -- Grant execute on the stored procedure. To test the functionality you need to login with AppAdmin account and run procedure as below. Here is the output from sysadmin account and they are matching!! !